Ceramic Spoon Rests - this oversized Polish Pottery Spoon Rest accommodates the largest ladles and mixing spoons. Use this stoneware spoon rest to keep range top or countertop clean and neat. 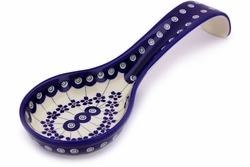 Durable Polish pottery ceramic Spoon Rests are made of superb quality stoneware. Oven, microwave, dishwasher, and freezer safe. 100% Lead and Cadmium free paints and glazes. Resist chips and breakage. Individually handmade and hand painted.